The Pro Evolution Soccer Six (PES 6) game created. In it already has a variety of updates such as boots updates, balls, menus, faces, kits and team updates also 2017/2018 season. In addition Update can also be used for Online. New sound effects in the game. Download and install PPSSPP Gold from the link above. Open the extracted folder and copy the PES6.iso to SDcard >> PSP >> Game. 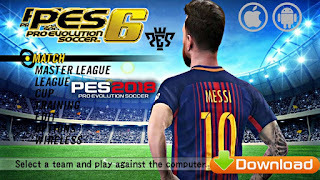 Lastly, launch the PPSSPP Game you installed from the link provided above and spot games, then click on PES 2018. You can now play the PES6 Version on your smartphone for free.